Let's call Brooks Range's Rocket Tent proof of concept. And the concept is a clever one: reduce weight to the absolute minimum by hybridizing ski gear. 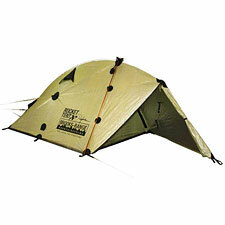 Instead of forcing you to carry the usual complement of dedicated tent poles for structural integrity, the Rocket Tent allows you to use your ski poles and avalanche probe instead (items which presumably you're already going to be carrying), thus keeping effective tent weight to a very impressive one pound, seven ounces (measured). That's a full pound lighter than the lightest conventional tent I've ever tested. Should you decide you want to carry extra poles, the Rocket Tent comes with a set of cross-struts and a spine pole, bringing total weight (tent+poles) to a still-remarkable two pounds three ounces. Like Black Diamond's Firstlight, the Rocket is a single-wall tent—there is no rain fly. Unlike the Firstlight, however, the Rocket is not built of breathable fabric. Ventilation is accomplished solely via the door, plus several small vents placed within the body. First impressions on the Rocket Tent's CT3 fabric: it's very light, very crinkly, and smelly (similar to uncured epoxy resin). The smell eventually goes away after the tent is unrolled, but it's hard to shake the notion that you've just bought a very expensive tent made out of party-balloon mylar. Can such a thin, ultralight fabric really hold up to the rigors of winter camping? The answer, surprisingly, seems to be yes. Similar to material used to make space suits, Cubic Tech's CT3 is a non-woven laminate impregnated with Dyneema fibers for unmatched strength and rip-stop capability. While I was unwilling to try poking a $500 loaner tent with a knife, I did inquire further about the tent's ability to resist propagating tears. Brooks Range related an incident in which a climber punctured the tent body with crampons during a wind storm. Amazingly, the punctures did not propagate or shear. As for waterproofness, every single seam is fused rather than sewn, and CT3 fabric has a claimed 5000mb (72psi) water resistance—impressive. And if that's not enough to dazzle you, the Rocket Tent's silvery fabric is said to reflect radiant heat, keeping you warmer in winter and cooler in summer. In actual use, I found the Rocket Tent consistently challenged my expectations. The CT3 fabric is translucent, for example—not opaque. You can see through the tent's walls from the inside, such that the interior feels psychologically roomier and more pleasant than you'd expect. Actual interior room is quite small. Calling this a 2-man tent seems a bit of a stretch to me. You'd better be on very close terms with your climbing partner if you're going to room together in here. Let me warn you right now that the Rocket Tent demands practice when it comes to setup. I put your chances of setting up this tent in the field without prior instruction right around zero. Having read the instructions and pitched the tent several times inside and out, I wouldn't put money on my ability to set it up right now in the dark. The key problem concerns the opening for the spine pole—you won't be able to find it. The hole is so challenging to find, in fact, that I would probably put some kind of tape on the tent to mark its location before I carried the Rocket in actual use. While the Rocket tent is marginally free-standing, in reality you're going to need stakes and guylines to set it up. Without naming names, I'm going to admit that some ski mountaineers don't always carry avalanche probes, so let's add the spine pole (5.7oz) plus 8 stakes plus 4 guylines (3.9oz), bringing my effective minimum weight to two pounds, 0.5 ounces. In comparison, the effective minimum weight of a Black Diamond Firstlight is right around 2 pounds, fourteen ounces. So, here is a key question to ask yourself: if you're saving a pound of weight, are you getting a good trade in the bargain? One of the things that bothers me about the Rocket Tent's concept is that it forces you to tie up your ski hardware as part of the tent. If you want to go skiing, you've got to break down the tent. That greatly reduces the Rocket Tent's appeal as a base camp shelter, since you'd be forced to repeatedly take it down and set it back up again. How annoying would this be in actual practice? Everyone would probably have their own opinion on the subject. Opinions will also vary as to whether the Rocket Tent's interior is merely Spartan or unacceptably cramped. But as I say, what you can't argue is that the Rocket Tent successfully demonstrates the viability of its concept. As I was packing it up to return it to Brooks Range, I felt more than a little tinge of regret. How would the Rocket Tent fare for the Shepherd Pass approach, I wondered? I'll kill to save a pound of weight there. And how about a Sierra crossing? No doubt you have your own ideas regarding trips where the Rocket's innovative minimalism might just make a big difference. The Rocket Tent is unusual, to be sure, but the more you think about ways to use it, the more irresistible it becomes. And, for just about the same amount of weight, it sure beats a bivy sack.